Neat: The WordPress.com stats helper monkeys prepared a 2013 annual report for this blog. Another game picked up by a publisher and more updates! 1. 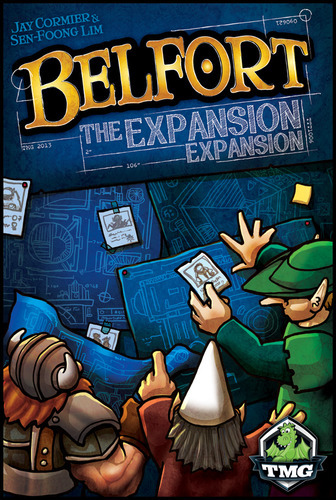 Belfort: The Expansion Expansion from Tasty Minstrel Games – this one took a bit of extra time through customs and didn’t make the Christmas shipping cut-off – but it’s something we can look forward to early in the new year! The expansion adds Assistants that you get to choose every round which give each player new abilities (and there are more Assistants than you need, making each game totally different! ), as well as Expansion Permits that let you expand your current buildings which unlock specific scoring opportunities that only you can take advantage of! 2. But Wait, There’s More from Toy Vault – Expect to see a Kickstarter for this party game early in the new year – January or February we think. We’ve signed the final contract and so it’s not a secret anymore and I think it’s ok to announce that the game will be set in the Monty Python universe!! How crazy is that? Very exciting to be a part of the Python world!! 3. Tortuga from Queen – Expect a Kickstarter for this one in January! This one used to be called Swashbucklers, but that didn’t translate well to other languages, so it’s been changed to the very piratey island of Tortuga! We’re very excited about this one and have even seen some early art for it. This could be a big hit for us! It’s a simultaneous roll and assign your dice game about finding and stealing treasure from other pirates. 4. Akrotiri from Z-Man Games – we’ve seen almost all the art and the rules, so I’m expecting it to come out in the first half of 2014, but we’re not sure. This is our 2-player strategy game that has tile laying and a pretty nifty mechanic where you have maps that tell you where temples are hidden – even though the map is different every time you play! Very cool. 5. Pop Goes the Weasel by R&R Games – we’re not done the contract phase of this one yet, so it’s not 100% official, but it should be soon. This is our first kid’s game where you roll 2 dice and choose one as movement and the other as how many mullberries you get to take. It’s pretty clever for a kid’s game! 6. This Town Aint Big Enough for the 2-4 of Us by Tasty Minstrel Games – we’re not done the contract phase of this one either but we should be soon! This is a micro game that use 25 tiles full of cowboys, each trying to get more in a town than the others. I’m happy about the gameplay – and possibly even happier with that title! 1. Rock, Paper, Wizards – We sent this into Filosofia awhile ago and they liked it, but not enough to publish it. We (Sen-Foong Lim, Josh Cappel and me) worked on it for months and finally cracked it in November. We tested the heck out of it and have just re-sent it back to Filosofia. We can’t wait to hear what they think of it! 2. Lions Share – we sent this to Amigo Spiele awhile ago and had a positive email from them before Christmas stating that they already returned all the games that they didn’t like back to the designers – so that means that they still like Lions Share. We’ll see what happens in the new year. 3. Junkyard – Filosofia has had this one for awhile, and they really love it but are having challenges with figuring out how to make it affordable as it uses many unique pieces of wood. They’re working with some manufacturers to try and figure that one out. 4. SimpliCITY – Flux Capacity has expressed interest in this game when we were at Hammercon in November. Since then we’ve tweaked and balanced it even more. Since the publisher lives close to Sen, they’re going to play it later this weekend! Crossing fingers! I really like how this game has evolved! 5. Aladdin: Cave of Wonders – the Game Artisans of Canada are putting together a collection of games, with each one based of a different fairy tale or fable. The idea is that each game in the set could be played on its own, or there would be a story mode with benefits to playing one after the other. This one was just sent to PSI as they volunteered to help us assess the age range of some of the games in the collection. UPDATE – Belfort: The Expansion Expansion clears customs! Dunno if you’ve been following the Kickstarter updates or not, but here’s the good news: After an extended wait due to production / shipping / customs delays, we’re finally able to say that the Expansion Expansion should be in the warehouse awaiting shipping. Because this is a stupidly busy time of year, the logistics of getting this to all backers and then onto store shelves is going to be the issue now. But, on a positive note, Amazon is providing the fulfillment for the Kickstarters, and they are experienced at getting things to people in good time, Christmas or no Christmas! So, please, bear with us and we’ll all be playing with the Gorgons, Halflings, Pixies, and those darn Imps in no time flat!